At approximately 7:15 a.m. on November 13, 2012, two students spotted a bobcat on our campus near the auditorium construction site. Administrators quickly contacted Animal Control and School Safety. School Safety secured the area until Period 2 began and students were in class. At 9:07 a.m. Pueblo implemented a lock down so that when the bobcat was tranquilized, there would not be any danger to our students. After three tranquilizer shots and 75 minutes for them to take effect, the bobcat appeared on the roof and fell asleep. The bobcat was secured in a crate by Animal Control and the lockdown was ended. 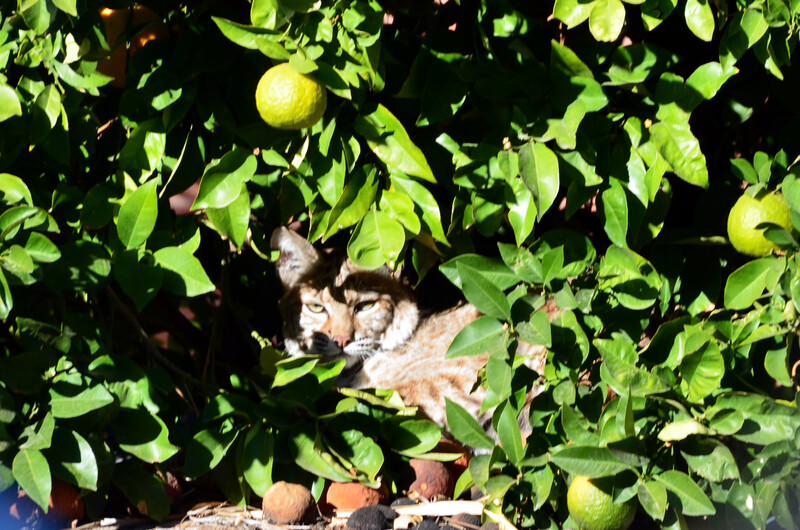 Animal Control plans to release the bobcat near the Tortolita Mountains. In September of 2010, a raccoon visited our campus and now we can add a bobcat to that list. We assume they want to be Warriors too! Warriors Jahlil Anderson, Dulce Cordova, Enrique Garcia, Vero Robles and Gardenia Tapia represented the Pueblo Team for the United Way-Days of Caring. The Pueblo Team was joined by United Way Representative, Mike Vogt, and C.E. Rose Principal, Steven Trejo. After arriving at school at 7:00 a.m., the team represented Pueblo at the rally at Hi Corbett Field and then proceeded to C.E. Rose to collaborate on breaking ground for the new primary playground. C.E. Rose is a natural site for our service learning as it is one of our feeder schools. They are recipients of the fieldwork by Pueblo students from our Education Professions class and our Early Childhood Education class under the excellent instruction of Ms. Bonnie Stull. As University of Arizona Baseball Coach Andy Lopez said at the United Way Rally, “everything you do in life is a value statement”. Today the Pueblo Team showed that we are willing to work to make our extended community a better place for children. During the summer, almost 150 incoming freshmen (Class of 2016) got the chance to experience high school classes through the Freshman Academy Program at Pueblo. For eleven days students took scheduled classes in Math, Statistics, English, Science, and Study Skills learning a multiple array of subjects and the organization of the campus to help them prepare for their first year in high school. 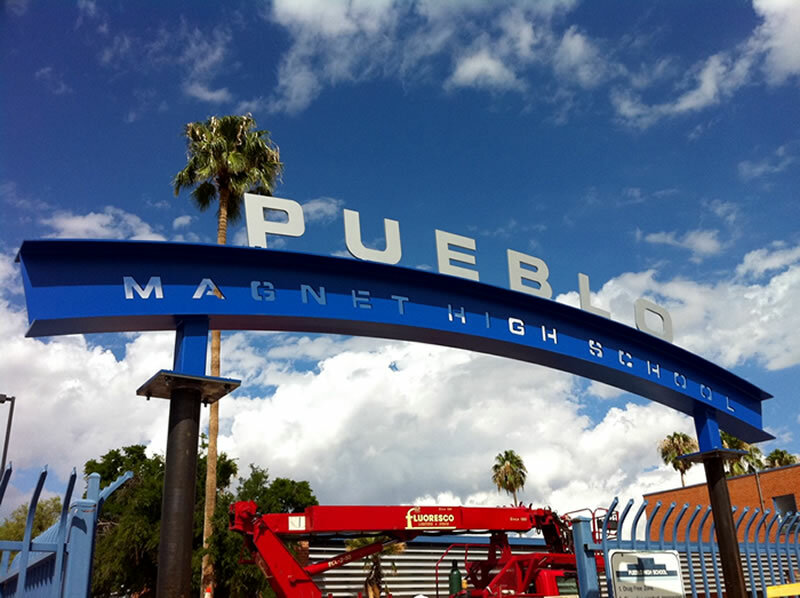 All the summer program classes laid the foundation for the future academics these students would encounter at Pueblo, with an emphasis on the Core Standards and STEM projects. 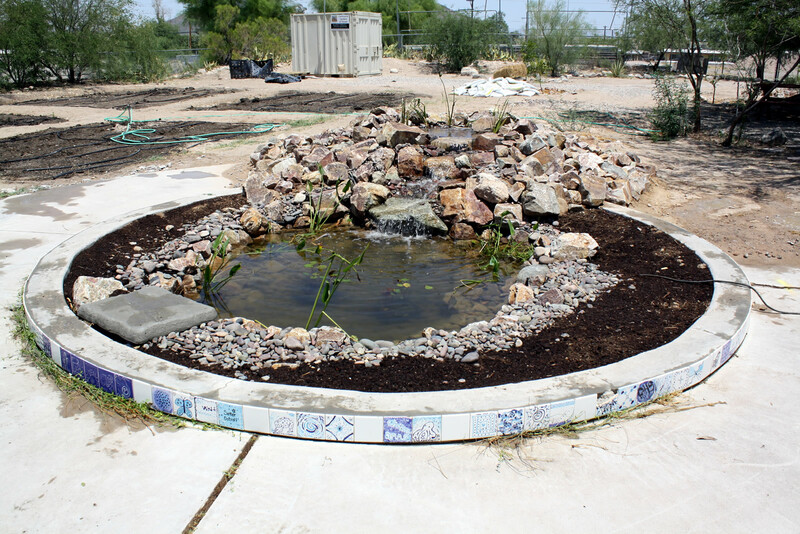 For example, in science, the students were challenged to design and create a pond ecosystem to replace the old drained cement pond located in the area of the new campus community garden. Pond in Community Garden before renovation. First, student teams used classroom laptops to research about the ecological aspects of pond wetlands. Then they brainstormed about different pond designs. Nathan Novak, a local landscaping expert and owner of Canyon Pondscapes, worked with the student teams to draw out pond design plans that were within the renovation parameters. Each class voted on team proposed designs and a consensus was reached. For four days each class eagerly participated in bringing this design to fruition despite the June heat. Under the direct supervision of Mr. Novak and Mrs. Straub, their science teacher, the students used a jackhammer and sledgehammer to break apart two feet of concrete to deepen the pond and remove the loosened concrete. 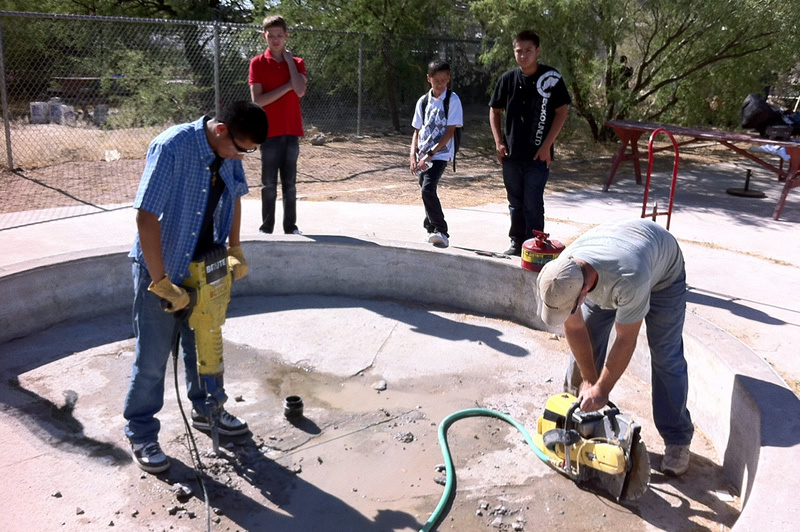 Students use jackhammers to loosen concrete. 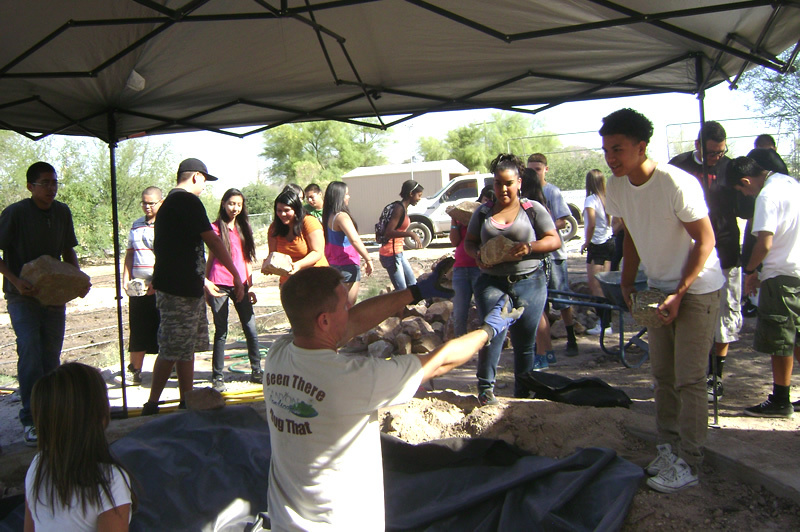 The students then carted in dirt to shape the pond to their design and laid down a liner to prevent water seepage. Rocks and gravel were placed in and around the pond to hold the liner as well as create a natural look. The next step was the creation of the water fall. Every class wanted to see this to be the main attraction of the pond. This meant the coordination of many dirt toting wheelbarrow teams and lots of dust. Before they knew it, a hill of dirt was ready for rock placements to create the waterfall. 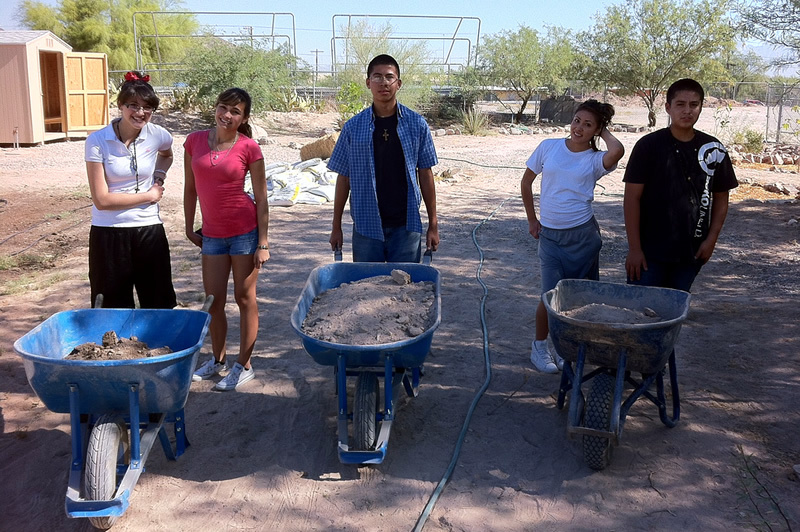 Students hauling dirt to shape pond. Finally water was added, the pump turned on and manure was placed along the edges of the pond for future planting of flowers. 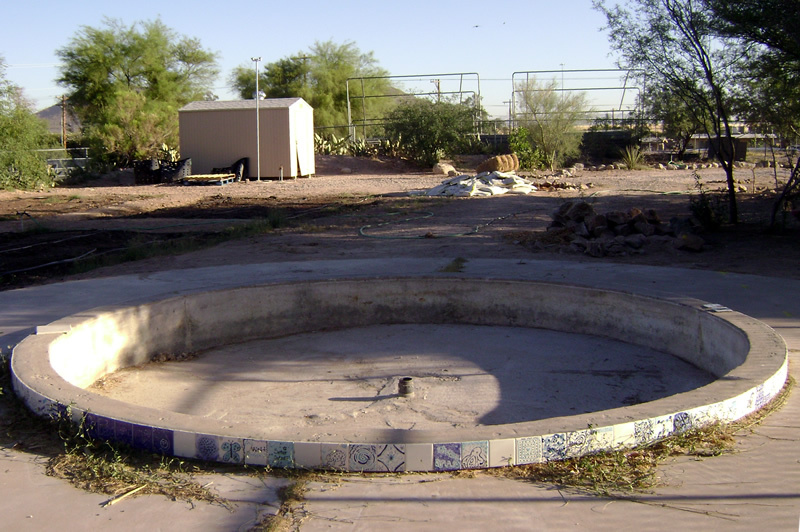 A pond and waterfall emerged from the ideas and hard work of these new Pueblo Warriors. The students felt a great accomplishment not only in completing a student driven project, but in learning how to work as a team to benefit the community by building a wetland pond ecosystem. Rocks going into place for new pond. As a final assignment, the students wrote about their experience. Overwhelmingly they wrote that despite the oppressive heat the experience was exciting, fun, and rewarding (the following student names are changed for privacy). Sam cherished the fact that he got to, “know how it feels to work like a grownup.” As Lisa pointed out, “a lot of sweat and hard work went into building something pretty that didn’t work and was plain before”. The students did not get to see the addition of plant and animal life, but water plants and fish will be added this summer in order to balance the pond ecosystem. Thanks to the Freshman Academy 2012 students, this new wetland pond ecosystem can be visited and studied by Pueblo students as well as enjoyed by those using the community garden for years to come. Thanks Elaine Straub for the story & pictures. The City of Tucson fiber optic line went online today at Pueblo. This upgrade will improve our network speed throughout the school. The project was started in April of 2010 with the digging and installation of the 12 strand fiber cable. TUSD Technicians activating fiber optic. The fiber optic line will boost our internet speeds. Pueblo will be able to download instructional materials in the classroom & our labs much faster. If you’ve surfed the web at school recently, you should notice a much welcomed improvement. 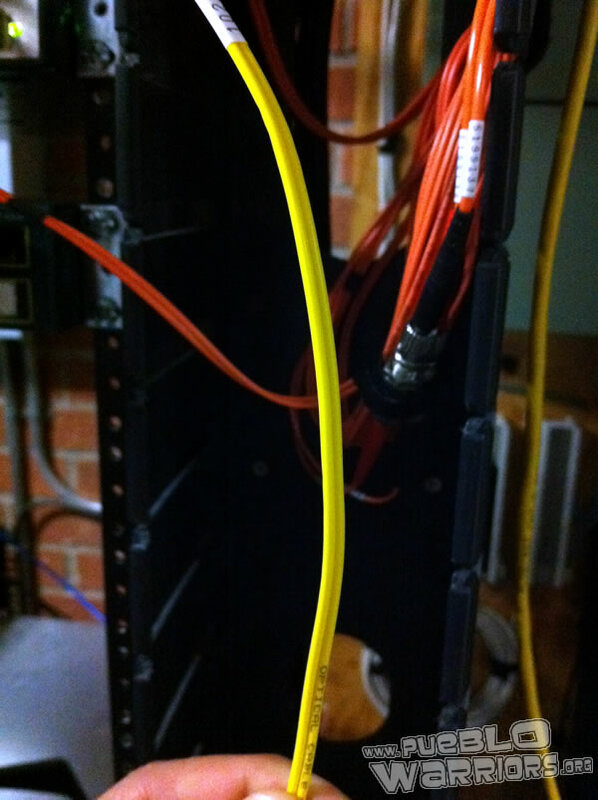 Yellow fiber optic cable making the big difference! We want to thank TUSD and anyone involved in this project for this huge upgrade. Notice the difference? Leave a comment below. 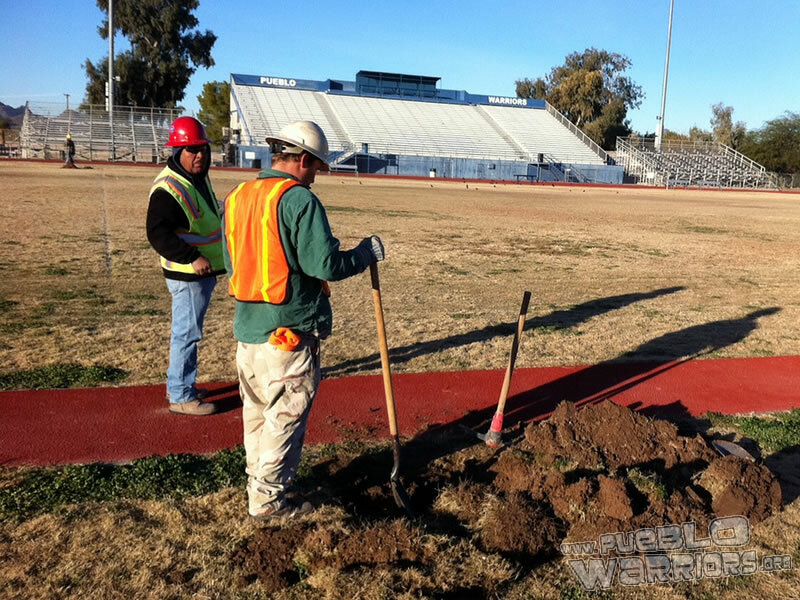 Pueblo’s football & practice fields will be getting new grass. A state of the art sprinkler system covering both fields to be compatible with reclaimed water are also being installed. The project officially starts today and will be completed in the Spring of 2011. Southwest Enviroscapes Inc. started digging for soil samples to determine what type of fertilizer will be used on new field. Heavy machinery will be used to scrape the old grass to make room for the new one. Football Field is all done! Looks great! The foreman that will be overseeing the project is Reyes Contreras, a Pueblo graduate from the class of 1979. Our athletes will sure welcome the new grass on both fields. Football field will be done first to be ready for track season & graduation. The practice fields will be done after the spring sports season. In case you haven’t noticed, our 12th Avenue entrance has changed drastically over the summer. The entryway construction has been completed and traffic is flowing nicely into Pueblo. The other part of the project is underway with the construction of the new archway already in place. The archway will be completed with red masonry as the base in the coming week. Then we move on to the big one, our new digital marquee. Stay tuned for updates and news on the completion of this project.